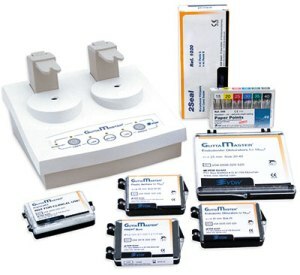 The GuttaMaster Obturation system is an efficient warm filling method and compatible Mtwo® NiTi system. It is safe and biocompatible filling material. It gives proven good 3-dimensional sealability. GuttaMaster oven has two separate heating orifices for heating endodontic obturators. It provides easy filling of lateral and curved root canals. Flowable alpha gutta-percha with low melting point allows apical sealing of the root canal including lateral canals and isthmi.